This item is not available for purchase online. Please call 1-406-222-5904 to order. - Graphic touch screen – all necessary information for the selected stitch is shown. - Extended Info system - more information on the use of each stitch, right at your fingertips. - Large sewing space – more space for coverstich projects. n 25 stitches – trim, stitch, overcast and decorate projects in half the time. - Coverstitches – great for sewing elastic hems, perfect for finishing all kind of knitwear. - Chainstitch – Join fabric layers where a traditionally pressed open seam is required. Works well as a basting stitch. - 5-thread overlock – combines two stitches for durable and reliable seams. - 4-thread overlock – reinforced overlock stitch for perfect sewing, trimming and finishing. - 3-thread overlock – wide and narrow overlock seams and decorative techniques. - 2-thread overlock – rolled edge and flatlock, wide and narrow. - Built-in rolled edge – sew 2 or 3-thread rolled hems quickly without changing the presser foot or stitchplate. 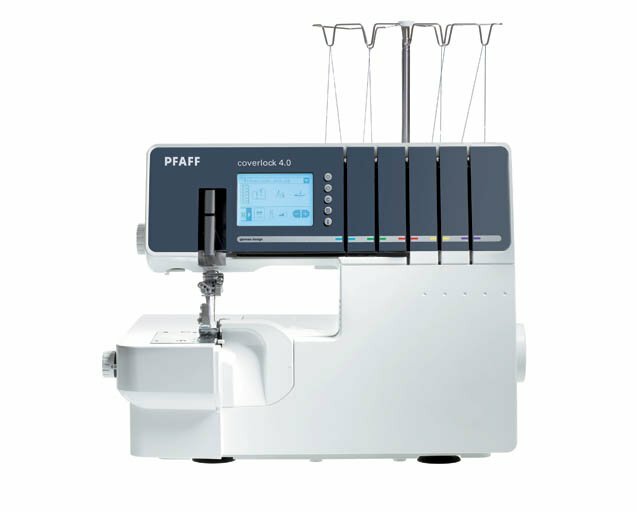 n Automatically sets thread tension, differential feed and stitch length – Select the stitch and start to sew. n Adjustable settings – all settings can be adjusted for special fabrics and techniques. n Dual LED light sources - maximum illumination of the sewing area for optimal visibility. n Memories – save your personal settings for each stitch, uniquely naming them for instant recall. n Last stitch – remembers latest stitch sewn when powering back on to instantly continue your project. n German Innovative Design – build to make sewing easy and to achieve the professional results that the sewer wants.